Junior quarterback Nate Burdette has emerged as one of eight-man’s top statistical players during the first month. The son of coach Bryan Burdette, he has helped the Eagles open 3-1. Last week, Maranatha lost a close game to Madison, 32-22, a squad that had not allowed a point through the first three weeks. He has completed 50 of 91 passes for 635 yards with a 15/5 TD/INT ratio. He also leads the team with 33 carries for 205 yards and five scores. Burdette has helped Maranatha score 234 points, tied with Clifton-Clyde for second-most in Division I. This week, Maranatha is at Chase County, a team that is 0-4 and has struggled with 51 points allowed per contest. Jahawn Byrd has quite a game in last week’s 83-21 win over KC Turner. Byrd rushed for 353 yards and six touchdowns on 23 carries to lead the Pioneers to their first win of the season. For the season, the 5-foot-8, 195-pound Byrd has rushed for 625 yards and eight scores. Byrd and the Pioneers will host rival Lansing this week. The Lions come into this week with a 1-3 record and have given up nearly 28 points per game. Through four games this season, Dressler has averaged 208 yards per game on the ground. The 5-foot-11, 190-pound senior has rushed for 831 yards and eight touchdowns. Last season, Dressler rushed for 886 yards and 16 touchdowns while earning second-team Central Plains League honors. Dressler is part of a Douglass offense that has averaged 36.5 points per game, including their 31-0 shutout loss to Garden Plain. The Bulldogs opened district play with a 60-14 rout of Neodesha last week. Douglass hosts Eureka on Friday with a chance to move to 2-0 in district play. After Derby starting quarterback Grant Adler went down with an injury, Hunter Igo stepped in and led the Panthers to a 24-6 victory at Bishop Carroll. Igo’s two-yard touchdown run go the scoring started and he added a 16-yard touchdown pass to Davin Sims in the third quarter. For the game, Igo passed for more than 100 yards and rushed for 72 more yards. It a similar situation to last season, when Igo stepped in for an injured Adler against Bishop Carroll and eventually led the Panthers to the Class 6A state title game. Igo, a standout defensive back when he’s not needed on offense, passed for 784 yards and seven touchdowns last season while adding 677 yards and 11 scores on the ground. This week, Igo will lead the top-ranked Panthers against winless Salina South. Lambert is one of the fastest guys in the state and he has shown to be one of the top backs in the run-heavy Central Kansas League. Lambert rushed for 112 yards on 22 carries (5.1 yds/carry). He'll take his speed to the next level when the Vikings play at winless Clay Center. The Tigers gave up 257 yards on the ground last Friday to Chapman, so look for the Vikings to establish the rushing attack and stick to it. Heading into the season the question for the Pratt Greenbacks was how would veteran running back Travis Theis transition to the role of quarterback in Jamie Cruce's Flexbone attack. Four weeks in, the answer comes in the form of 703 yards rushing on 48 carries with 13 TDs. But while Theis may seem like a one-man wrecking crew, he wouldn't get anywhere without his offensive line. Raiden Kohman, Andres Fernandez, Sevren Hance, Wyatt Schrag and A.J. Arensdorf join forces with tight end Jadon Koehler and receivers Kaden Evert and Brett Winsor to find Theis and backfield mates Caden Blankenship, Hunter Huber and Kadence Riner running room. The Greenbacks are sure to enter this week's game focused and ready in spite of Kingman's 1-3 record after the Eagles knocked Pratt out of the playoffs last year in one of the season's biggest upsets. Pratt is two years removed from a state title and appear poised to make another deep run behind Theis and an experienced offensive line. Dylan Spresser becomes the first 6-man player to be selected for the Picks to Click segment. The senior running back has put up impressive numbers in the Bulldogs’ first four game of the season having rushed for 710 yards and 18 touchdowns, while averaging 13.4 yards per attempt. Spresser also has caught six passes for 117 yards and four scores. 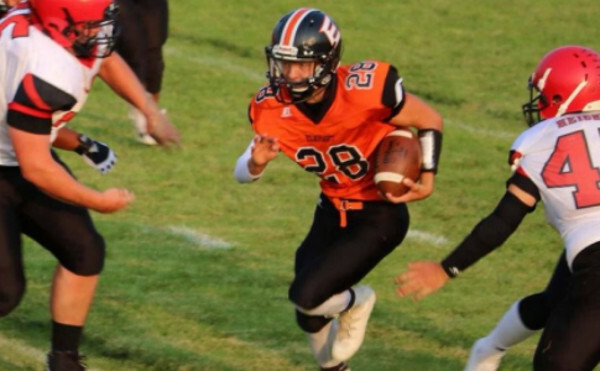 Teammate Caleb Korte, a two-time 6-man all-state selection, has added 424 yards rushing and eight touchdowns. Golden Plains has rolled to a 4-0 start while averaging 65 points per game. The Bulldogs improved their scoring average last week with a 92-47 victory over Cheylin. In that game, Spresser rushed for 295 yards and five touchdowns along with catching a 13-yard touchdown pass. Spresser and the Bulldogs will look to keep the points flowing against a Natoma team surrendering more than 52 points per game. After a breakout 2017 season where he ran for 2,054 yards and 28 touchdowns, Whisennand had been relatively quiet through Elkhart's first three games, rushing for just 329 yards. Then again, he only had limited carries in a pair of blowout wins and saw his opener against Cimarron cut short by weather. Whisennand was back in full force in the Wildcats' 54-0 win over Clayton, N.M. last Friday, rushing for 285 yards and three touchdowns. Last year against Meade, Whisennand ran for 219 yards and two touchdowns and also threw for more than 100 yards and a score in a tight 18-15 Elkhart win. Meade gave up 266 yards on the ground to Cimarron's Tate Seabolt earlier this year, so Whisennand could be in for an even bigger game this year against the Buffaloes.